2. Place almonds and panko in a food processor and pulse until the almonds are finely ground and well mixed. Pour mixture into a shallow dish. 3. Dredge cut asparagus spears in flour and shake off excess (not much flour will stick to the waxy spears, but that’s okay). 4. Dip each spear into the egg wash followed by the panko mixture. Cover each spear in the panko mixture until fully coated. Season with salt and pepper. browned. Season with salt and pepper. 6. For tomato jam: Heat oil in a medium saucepan over medium-high heat. Place first 6 ingredients into the pan and sauté for about 5 minutes. Add tomato paste, oregano, thyme, and rosemary and continue to sauté for 3 minutes. Deglaze pan with the wine and vinegar and cook until almost all of the liquid has evaporated, about 3 minutes. Add the remaining ingredients and lower the heat to medium. Allow the mixture to simmer for about 30 minutes, stirring frequently. Season with salt and pepper. Pour the hot mixture into a food processor and pulse 3 times. Allow the mixture to cool. 7. For aioli: Place the egg yolk mustard and lemon juice into a mixing bowl and whisk together. In a measuring cup, stir together the two oils. Pour the blended oil into the yolk mixture, while whisking, until fully emulsified. Whisk the roasted garlic paste into the mixture and season with salt and pepper. Stir. 8. For bleu cheese sauce: Place all ingredients into a mixing bowl and whisk together. Season with salt and pepper. 9. 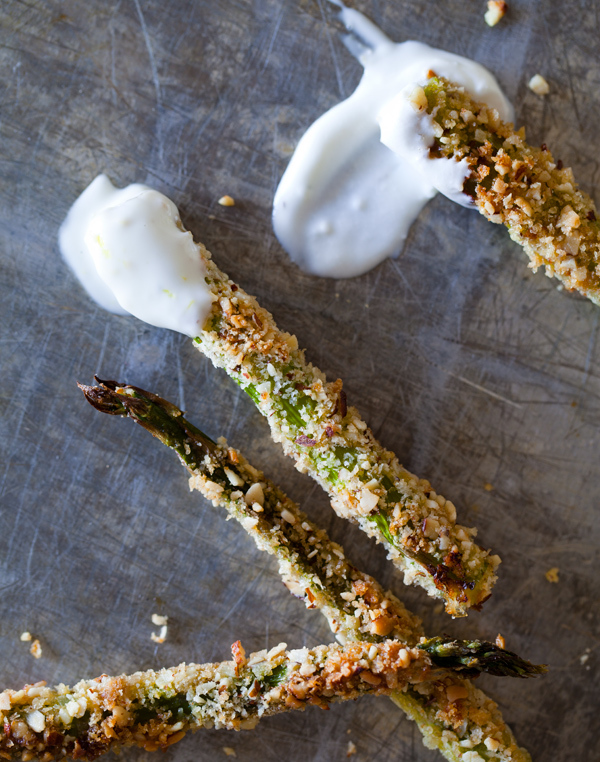 Serve baked asparagus fries with the trio of dipping sauces.